Rings have an appeal for both boys and girls, from the youngest to the oldest. Either wood or leather ones can be made with initials, designs, or plain finish. These wooden rings turn out great, and would even make a great gift for your father, as well as your mother. This craft makes a great Summer Camp craft. This craft requires parental assitance and supervision. (Parental Assistance and Supervision Required) Maple, cherry, or walnut will make good tough ring blanks. With a pencil and square, mark off one-inch squares on the wood. Find the centers of the squares by drawing diagonals, and with a brace and bit, drill 5/8-inch holes at each intersection. This size will fit children eight to twelve years old on some finger. If working with younger or smaller children, drill holes 9/16 inch. Holes can be enlarged with a needle file for custom fit by the children. Saw the board into one-inch squares after all holes are drilled. A drill press will come in handy, but drilling by hand for a group will not take an excessive amount of time. Any number of styles can be made. For younger children, mark the ring with a pencil, so that they will have guide lines and be able to tell what portions to remove. Always plan rings with the end grain of the wood at the top of the ring. 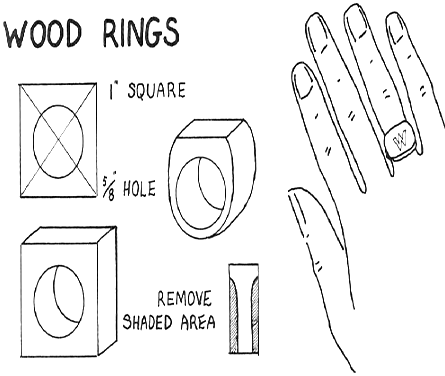 Rings can be worked down with coping saws, files, and sand-blocks. Younger children can do the work more easily if they stick to files and sandblocks. After shaping the ring, finish and polish with successively finer garnet paper, and emery cloth, and then coat with boiled linseed oil and rub well with a rag. The rubbing will cause the oil to penetrate and dry, and will bring out the attractive grain of the wood. The more it is polished, the higher the shine. CAUTION: When through with the oily rags, take them away from the children, and either dispose of them by burning, or spread them out in an airy place to dry. If stuffed into an uncovered waste-can, oily rags can easily start a fire by spontaneous combustion.